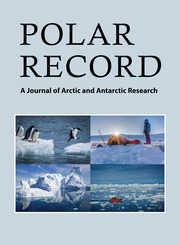 Polar Record publishes articles in a wide variety of areas of polar research in both the Arctic and the Antarctic and keeping its readers up to date with an extensive range of topics and concerns. The journal includes original primary research papers in the physical sciences, life sciences, polar technology, humanities, and social sciences, as well as papers concerning current political, economic, legal, and environmental issues. Notes, review papers, book reviews, letters to the editor, guest editorials, obituaries, and ‘In Brief’ items of general interest are also published. Exploring a sub-Antarctic wilderness: a personal narrative of the first biological and geological expedition to Marion and Prince Edward islands 1965/1966. Brian J. Huntley. 2016. Stellenbosch: Antarctic Legacy of South Africa. 268 p, illustrated, soft cover. ISBN 978-0-620-70521-9 (e-Book ISBN 978-0-620-70522-6). ZAR250.